I have just returned from a GREAT trip to our Great Barrier Reef with my Dad and Coral Expeditions! 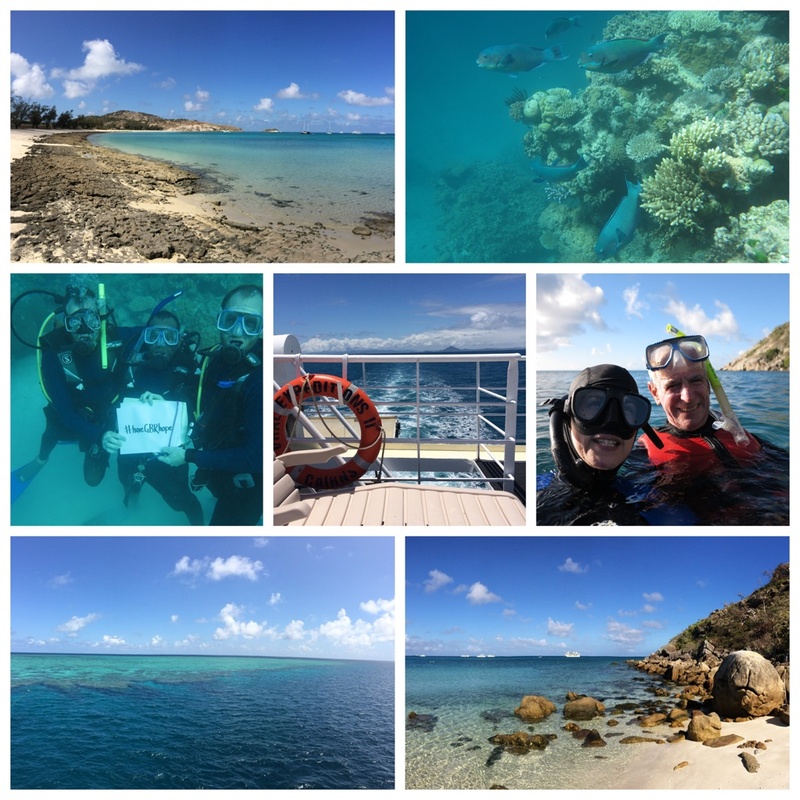 The cruise departed Cairns and headed North where we stopped and explored Cooktown, Lizard Island, Ribbon Reef # 9, Ribbon Reef #3 and Escape Reef! What a fantastic crew, scrumptious food and breath taking seascapes! It was great to meet so many new “Friends of the Reef” on our cruise too, from six countries! This is a GREAT way to ‘sea’ our Great Barrier Reef (GBR) where you certainly see the beauty in nature everyday. There was SO much to see and do on this trip with some GREAT illustration inspiration for me on the Reef as I progress to the final stages of illustrating my kids picture book about the Great Barrier Reef. I got to see my first octopus on this trip which was very exciting and I was absolutely amazed at the colour, life and noise of the outer barrier reef. Remembering that “colours are the smiles of nature”, so the GBR was beaming! It was also GREAT to see how the crew and passengers were ‘on board’ with my kids picture book about the Reef, as everyone was keen to have their photos taken with the hashtag (and key message) of my book #haveGBRhope. Being with these global citizens of the Great Barrier Reef reminded me how much sea-ing the Reef and learning about the Reef leads to loving it! SO GREAT!! A special thanks to my Dad (and Coral Expeditions) for a GREAT trip to the Reef!! You can keep updated on the progress of my kids picture book about The Great Barrier Reef and dive in with me and follow my creative journey via my alter ego Dr Suzie Starfish and @suepillans on Twitter and Instagram. Hi Toni, Happy New Year! I hope you and the family had a wonderful Christmas. In regards to your question on the plight of the Great Barrier Reef, yes the Reef is in danger of dying as reported in the news reports. We need to take global action regarding the impacts of climate change and reduce our greenhouse gas emissions, as a starting point. But, we also have to have GBR hope that we can and will help to save the Reef.